Use the form below to inquire about Resort Near Baga Beach At Calangute . Use the form below to reserve for Resort Near Baga Beach At Calangute . Redefine affordable indulgence on your trip to North Goa with a stay at the Luxury Resort near Baga Beach at Calangute. Goa is a melting pot of diversity and cultures, and a haven for beach lovers. It is one of the most popular tourist destination for both budget and luxury travelers from all over the world. And why not! The love of the sun, sand, and sea is too hard to ignore. While this little coastal state has these three in abundance, it also has a plethora of food haunts peppered along its beaches that are ever enticing to those who love to entertain their taste buds! With the cozy suites, breath-taking views, and modern amenities it offers, this Resort near Baga Beach at Calangute is sure to live up to your Goan holiday expectations. Other than its spectacular beaches, Goa also has a rich heritage. 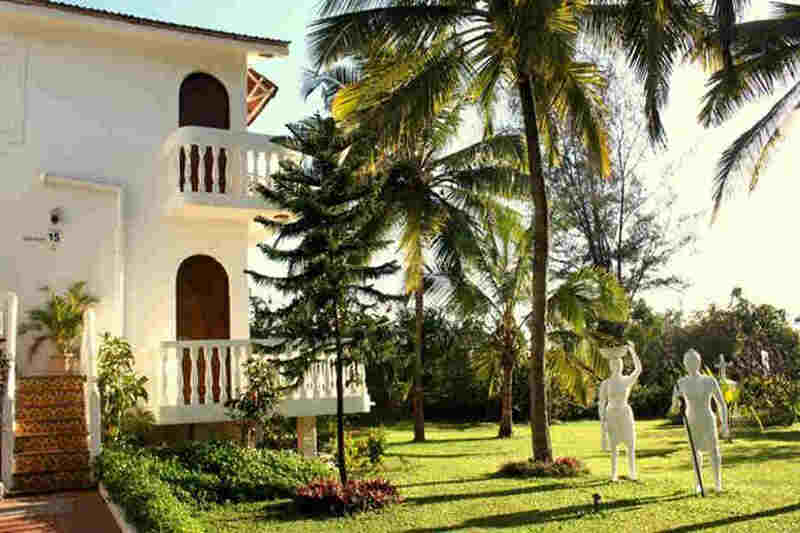 This Luxury Resort near Baga Beach at Calangute is a true reflection of that heritage. Located on a sprawling 4-acre property right next to Baga Beach, the resort features lush green gardens and lavish accommodation. Located close to the major markets, tourist attractions, and happening places in North Goa, this all-suite hotel is a great place to be when you want to lounge back and rejuvenate. In addition to providing a lavish stay, the resort also takes care of your love of food. Midnight cravings? No problem! The resort’s in-house restaurant and bar are open 24 hours to attend to your taste buds. This Portuguese colonial-style property houses three types of rooms, each named after the view it offers: Garden View, Pool View, and Beach View. Every room at the resort has a living room, a bedroom, ensuite bathroom, and a private balcony to enjoy the view. The rooms are well-furnished with luxurious upholstery and equipped with amenities such as a coffee maker, refrigerator, and Wi-Fi among others. What’s more? The experienced and friendly staff at the resort will make your stay memorable by guiding you through local sightseeing, shopping, and activities. So, come and lose yourself in the sun, sand, food, breeze, and everything Goan at this lovely Resort near Baga Beach at Calangute in North Goa. Bookings are confirmed only upon the receipt of full payment. Unpaid bookings might be canceled. During check-in, guests must show a valid identity proof as per the security regulations of the government. Foreign nationals must carry their passport for verification. When you’re in Goa, it is a must to stroll at the beach, play tag with the waves, and watch a blissful sunrise or sunset while the sun colors the horizon in various hues of yellow and orange. In between these leisurely activities, you could also visit the many attractions in the state, including heritage sites, forts, churches, traditional Goan and Portuguese houses, museums, and more. If you’re a nature lover, then you could also visit the various sanctuaries and nature reserves that are home to elephants, native and migratory birds, and other animals. Take a break from outdoor excursions with the activities that the resort has lined up for you. You could play snooker, sweat it out at the gym, or bring out the Phelps in you in the resort’s swimming pool. The pool is also ideal for leisurely dips to beat the heat and humidity common at the coast. Should you want to rejuvenate your body and revitalize your mind and soul, head to the resort’s spa to ease the stress out of your body with different massages and therapies. Mapusa (11 km), Panjim (17 km), Margao (48 km), Mangalore (387 km) ) via NH 66, Hampi (361 km) via NH 67 and NH 748, and Mumbai (566 km) via NH 66.